The author in July 2013, and the author today. I don’t have prosopagnosia, otherwise known as face blindness. Recognizing other people’s faces has never challenged me. In fact, I tend to remember and recognize others’ faces rather well, just as I also learn names fast. There is, however, one face that I can rarely look at and say, “Oh, I know who that is.” This face is my own. The revelation never struck me until this summer, when I was taking a full inventory of my various psychological oddities in preparation for a new phase of therapy. Amidst a host of other questions I asked myself, I wanted to get to the root of why I am someone who can’t stop staring in mirrors and, yes, taking selfies. What I have concluded is that I can functionally identify my own face, my own person, when viewing a reflection, a photograph, or a film/video recording— but that is only because, since time immemorial, all evidence has pointed to those images being of yours truly. In the meantime I have always felt dissociated from that image, not in the sense of body dysmorphia but in the sense of literally feeling as if the person reflected or recorded is not really me. My inner self-image is not of somebody real. Sometimes this does lead to vanity, or giving off the impression of vanity. In my constant quest to connect with the person I look like, I ceaselessly examine my favorite features to affirm to myself, “Yes, this is me, I like how this part looks,” and I stare in disappointment at other features as I try to process the fact that no matter how much I don’t like how x looks, it is actually me as well. And I loathe having any photo or recording taken of me that I don’t control from start to finish. When I look at a recording someone else has taken, or even a photo taken from a bad angle, I don’t just hate it because it fails to adequately flatter me; I hate it because it frustrates me by making me stare at it while I perform mental gymnastics to accept the fact that it is me. Half of my Instagram account, as my friends know, is selfies, and I have this habit because it helps me practice acceptance of my appearance, plus it gives me a chance to get photos of myself that come closer to the version of myself that I see when I close my eyes. I don’t think this is unusual for someone who was both raised in a body-negative society and came to identify as trans over time. But I do think it’s important to distinguish that at the end of the day, I really don’t consider myself ugly. I have a fairly realistic understanding of how much fat is on my bones, too, and I’m confident that I have no features that look bigger or smaller to me than other people would imagine. And when I’m just feeling my body, feeling my body’s place in space, I don’t experience any of the dysphoria I used to. My confusion and even anguish are just tied to the fact that my mind’s eye is not in agreement with the sensory information I get, when it comes to my looks. This, I suspect, is the strange thing— the thing that makes it less typical for my upbringing and demographics. But maybe it’s really there for a lot of people like me. I don’t know. In fact, while other trans people’s mileage may vary, I have concluded lately that a portion of my lifelong gender challenges has been that no adherence to any standard gender presentation can help me recognize myself better. The photos at the top of this post are respectively from three summers ago and this summer. When I took the first photo, I still identified as a binary trans man, albeit with some genderqueer leanings, and I was about eight to nine months from a total collapse of my effort to maintain such a gender. 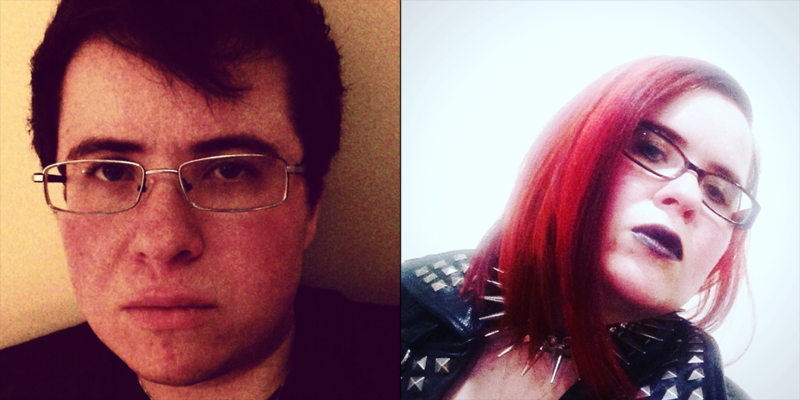 In the second photo, you can see a nonbinary, fey leather-femme, who has dyed xir hair bright red and is now embodying a much more iconoclastic imag than before. I know that these are both me. I do not feel that they are both me. The second photo comes a lot closer to the mark, but not because it is more recent— just because it is me doing a better job at making myself look like something I can recognize. I don’t know if I will ever do a completely adequate job. There are some things I will never be able to change. My face is just all wrong, even though I think it’s reasonably attractive now. Beyond my face, I’m so much shorter in reality than I am in my head, it’s somewhat absurd. I feel as if I probably stand about 5’7″ or higher, and I absolutely don’t. By some laws I am a dwarf (and I’ll take that word over little person, by the by). Maybe I should start wearing six-inch heels. I don’t know. There is no special point to this piece. It is an observation, an explanation of something about myself, and probably not much else. I will probably write similar pieces over the coming months, if I find the energy and time. In the meantime, whether you like my selfies, don’t like them, or didn’t know I took them all the time, now you have the story behind them.